The following instructions will help you select the proper size Bilco steel sided door for your home. 1.Disregard your old door and measure (in inches) the dimensions of the existing areaway foundation. 2.Measure dimension W1, the inside width, and dimension W2, the outside width of the areaway foundation walls. 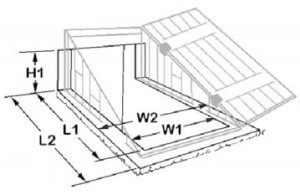 3.Measure dimension L1, the inside length, and dimension L2, the outside length of the areaway foundation walls. 4.Measure dimension H1, the height from the top of the areaway foundation to the top of the opening in the house foundation.